Jasmine “Jazz” Bashara is a porter and smuggler living in the Moon’s first and only city, Artemis. She’s been trying to save up for a special purchase but just can’t make money fast enough. When one of her regular clients offers her a massive amount of money for an illegal and dangerous job, she jumps at the chance to take it. Of course it’s illegal and dangerous for a reason and she ends up in deep trouble. She must figure out how to take down the organization gunning for her head while also not getting deported for breaking the law. 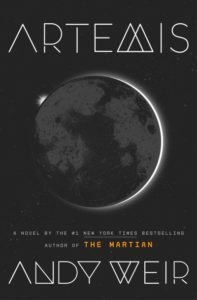 I absolutely loved The Martian when I read it so I was looking forward to reading Artemis. On the surface, the two books are fairly different – Artemis is a crime thriller and heist novel. However, they both have the same underpinnings of rigorously detailed science, a somewhat immature sense of humor, and a focus on being fun to read. There’s been a lot of hype about the protagonist of this book, Jazz, being a Muslim woman; most negative reviews of Artemis mention being disappointed by her portrayal. Her gender and her religious beliefs are not a significant part of her identity, though; they just add a bit of background color. The fact that she is an naturally good welder is more relevant to her identity than her gender and that’s okay (I’m female and Indian but I identify far more with bibliophiles or programmers or people who like to cook than with women or other Indians). Plus she is first and foremost the protagonist of a fun heist novel and she’s got the sense of humor and adventurous spirit to go with it. I know I mentioned the rigorous science already but I’m going to mention it again because it’s the best part of the book. There is so much detail about how the city functions, how it’s planned and put together, the economy around it, and so on. It really gave me a sense of both how much work humanity will need to do to actually begin expanding to the stars and confidence that it’s a solvable problem in the near-term. You don’t really think of worldbuilding as something that’s necessary for a near-future story like this, and most authors just handwave the details away. But Andy Weir rivals the best fantasy worldbuilders (like Brandon Sanderson) in figuring out all the background details and casually referencing them. It makes the world feel immersive and alive, like there’s so much more to explore that isn’t relevant to the current story. It’s like a movie that has been shot on location, rather than building a set with the minimal details needed for the particular scene. And the science is not just limited to background details. The physics of how things work on the Moon is integral to the plot, and the author manages to make what’s essentially slow and careful welding riveting. The weakest part of the book is undoubtedly the dialogue, both inside Jazz’s head and her interactions with other people. Mark Watney’s juvenile humor worked so well in The Martian because we had sympathy for his situation and forgave him his not-so-funny remarks because we didn’t want to him to go crazy in his loneliness. Jazz has a similar sense of humor but it’s much less tolerable because that’s who she is all the time and just comes across as childish. The dialogue suffers from some of the same flaws; although most of the epistolary segments were better. But I wasn’t reading the book for the characters or the prose so it didn’t detract from my enjoyment much.